Experts in SAP, EPCs, SBEM and energy-related planning conditions. We offer practical design solutions to help clients meet their energy and sustainability aspirations and regulatory requirements. Our team of experts deliver independent, cost-effective and timely advice to help manage risk and enable clients to ‘get it right first time’. Every year, our energy team produces over 20,000 energy ratings (SAP, EPC and SBEM) for new-build houses, conversions and commercial projects. Every year, our energy team produces over 20,000 energy ratings (SAP, EPC and SBEM) from single units through to the largest multi-phase developments. It is increasingly necessary to demonstrate energy efficiency above and beyond the normal requirements of Building Regulation Part L - either to comply with planning conditions, for example the London Plan or the Code for Sustainable Homes. Our specially trained energy team has substantial experience in providing energy rating services for new-build, converted or extended commercial premises. Getting good advice early in the process can help reduce the cost of your energy solutions. As an Approved Certifier of Design for Energy (Domestic) we can work with you to develop your designs and certify that they comply with the energy requirements of Section 6.
flexible payments - if you have an account with us you don't need to pay for your EPCs until they have been produced. fast, efficient service - if you use NHBC for building control we'll already have access to your drawings and you can upload more information via our extranet to save time and money. delivery of your EPCs with an easy to manage schedule plus your certificates and SAP data available to view on our extranet. automatic co-ordination of your EPCs if you order EPCs at the same time as your SAP calculations. a complete compliance solution if you choose NHBC Building Control or our energy, sustainability, acoustic and air leakage testing services. Choose multiple NHBC services and our teams will work together to ensure the quickest, most cost-effective route to compliance. Why do you need Energy Performance Certificates? 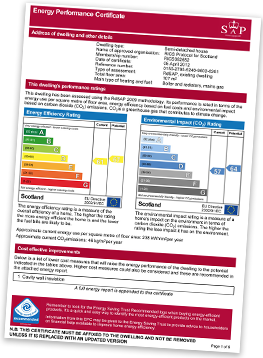 Since 2008, all homes and commercial buildings when built, sold or rented have needed an Energy Performance Certificate (EPC) to comply with the EU Energy Performance of Buildings Directive. Energy Performance Certificates (EPCs) provide a rating of the energy efficiency and carbon emissions of a building from A to G, where A is very efficient and G is very inefficient. Our expert assessors are accredited to carry out 'On Construction' EPCs for new build properties. unrivalled expertise to help you SAP Methodology. unrivalled expertise to help you understand the requirements of Part L in England or Wales, Section 6 in Scotland and Part F in Northern Ireland. fast, efficient service - there's no need for site visits and, if you're also using NHBC Building Control, you will only need to submit your plans and drawings once. a complete compliance solution if you choose NHBC Building Control or other energy, sustainability, acoustic and air leakage testing services. Choose multiple NHBC services and our teams will work together to ensure the quickest, most cost-effective route to compliance. Why you need SAP Energy Ratings? Building Regulation Part L in England & Wales, Section 6 in Scotland and Part F in Northern Ireland now requires SAP data for proposed new dwellings to be submitted to your Building Control body before work starts on site as well as on completion of the homes. SAP data is also required to show compliance with Code for Sustainable Homes energy requirements, and is also used in energy reports for planning. Why you need SBEM/DSM Energy Ratings? Building Regulation Part L in England & Wales, Section 6 in Scotland and Part F in Northern Ireland requires that SBEM data for proposed new commercial premises is submitted to your Building Control body before work starts on site as well as on completion of the build. Some Local Authorities ask for the calculations at planning stage. SBEM/ DSM data is also required to complete the mandatory Energy Performance Certificate. You'll need to let us have plans, drawings and a detailed specification of your proposed development. If you're using NHBC Building Control, we'll already have most of what we need. If not, you can use our free Extranet service to upload your documents online, saving time on print and post. find the most efficient route to compliance because they are uniquely placed to understand the implications of designing for planning requirements or Code credits whilst maintaining compliance with Part L and NHBC Standards. When do you need the service and what's involved? You should contact us as early as possible in the project lifecycle. We can attend design meetings with your team or provide our consultancy based on drawings which you send to us. Talk to us about how best we can work with you. The concept is similar to that currently undertaken for certifying Section 1 – Structures, where a SER Registered Engineer will provide Certification confirming the project meets with the Technical Requirements of the Building Regulations. Certifying your designs in advance means that your Verifier will be satisfied that your design meets the requirements of Section 6. And, because certified designs take less time to process, your Building Warrant fee will be discounted by around 10%. For the design certification service, contact us about a month before you intend to submit your warrant application. You must also tell your Verifier that you are using an Approved Certifier of Design. Alex has been working with builders and their associated professionals to demystify the building energy regulations across the UK since the late 1990s. His areas of expertise include Part L1a & L2a in England and Wales, Section 6 in Scotland, and Planning Energy statements. Jimmy is line manager to NHBC's team of assessors and consultants, and brings over a decade of experience to the department. He also provides SAP assessments and advice for complying with Part L (England/Wales), Part F (NI) Section 6 (Scotland), EPCs for the entire UK and Part L1b. Peter provide advice for clients to achieve Part L1a compliance through the deployment of SAP calculations and subsequent issuing of EPCs when appropriate. Steven primarily conducts energy ratings - EPCs, SAPs and PEAs - as well as delivering compliance reports (Part L1b), planning reports and Part L training.